Darien's Olivia Leunis swims the 100 Breaststroke as Greenwich High hosts the FCIAC Swimming Championships Saturday afternoon, Nov. 7, 2009. 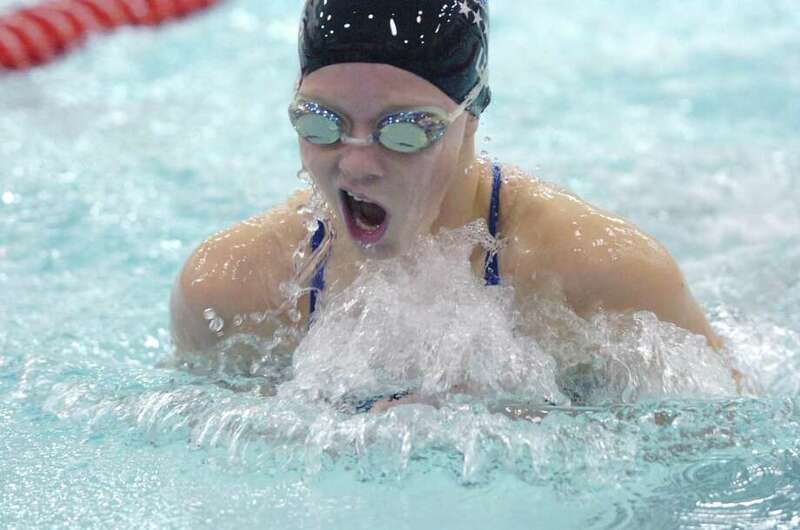 Versatility throughout the lineup -- young as it may be -- stands to carry the Darien High School girls swimming and diving team to another successful campaign, according to the coaches and team members. This team, with only five seniors, is shooting for its 11th state title under the leadership of coach Marj Trifone, who is beginning her 14th season. The Blue Wave, after a third-place state finish in 2010, won the Class L title in 2011 and is always a threat to win it all. "We definitely have our sights on the state meet again. It would really be nice to win states again," senior captain Olivia Leunis said. "The fact that we won last year pushes us to try harder this year. We're super pumped." "We definitely want to win state finals," senior captain Caroline Orem said. "We're a very versatile team. We just have to be smart where we put everybody in all of the meets." Darien stands to have its hands full with familiar FCIAC foes Wilton and New Canaan also in the L division of states, along with non-conference foes Cheshire and Pomperaug of Southbury. Wilton, which was last year's Class M champion, is new to L.
"We are in a very tough division," Trifone said. "Our division is going to be very tight. I think it's going to be a tough, competitive meet." Darien, historically one of the best teams in the ultra-competitive FCIAC, is coming off a fifth-place tie in last year's championships. The Wave will have challenges within the conference from the likes of Class LL champ Greenwich as well as the aforementioned teams that overlap into the L division. Orem swims the 100 yard backstroke, 200 individual medley and relay events, and Leunis is a relay and IM standout. The other two senior captains are diver Caroline Ashcraft and backstroker Claire Treesh. The other senior is Francesca Milewski, one of the team's top sprint freestyle competitors. Other sprint free swimmers are Amanda Bieler, Lauren Rutledge, Maddie Burke, Mackenzie Coughlin and Emily Nixon. Distance swimmers include Courtney Ferreria, Julia Stobbie, Lia Barsanti, Sam Schrenker and Elizabeth Kearney. Backstroke leaders are Orem, Treesh, Becca Maroney and Murphy Grady. The team's top breaststroke swimmers are Leunis, Victoria Chao, Barsanti, Megan Slaughter and Michelle Wall. In the 100 butterfly, Burke, Natalie Grune and Maggie Orem, younger sister of Caroline, are the top competitors. The IM and relay swimmers include several of the team members, providing that element of surprise the Wave can bring to a given meet to bolster its chances against a given team, depending on the opposing team's strengths in different areas. "We don't really have a lot of front runners on our team at all but we have a lot of depth on our team," Trifone said. That depth includes talent at the freshman level. Maggie Orem, Grady and Rutledge are all new to the high school swimming scene. "I have a very talented group of freshman," Trifone said. The big group of experienced, battle-tested sophomores and juniors includes Bieler, winner of the state's 200 free title last year. Bieler was one of just two state champs, the other being Caroline Orem, who claimed the backstroke title. Darien has had plenty of depth in the past, including last year when the team used numerous runner-up and top-five individual and relay finishes to capture the state title. So does Trifone expect to win states again this fall? "If not, we're going to be right there. I don't expect us to be far out," Trifone said. The season gets underway Wednesday at Fairfield Ludlowe. Some of the Wave's biggest meets are Sept. 25 at Wilton, the Oct. 3 home opener against Greenwich and Oct. 24 against New Canaan.